Okay, fans said, let's get somebody with imagination, with zest and zeal and anything else beginning with Z. So, St. John got it for them. He got the zaniest, maddest, most imaginative football coach ever to hit the Big Ten, and the record still holds. He got the Buckeyes Francis Schmidt from Texas Christian, and it was Schmidt who launched Ohio State's modern era of football eminence. Schmidt was a World War One bayonet drill instructor with a loud, raucous and colorful approach to the English language, the likes of which had never been heard on this serene and conservative campus. He also had a genius for offensive football. In his first year at Ohio State he stunned the opposition by displaying--in the same game--the single wing, double wing, short punt and, for the first time ever seen, the I-formation. He used reverses, double reverses and spinners, and his Buckeyes of the mid-thirties were the most lateral-pass conscience team anyone had ever witnessed. He threw laterals, and then laterals off of laterals downfield, and it was not unusual for three men to handle the ball behind the line of scrimmage. In his first two years he got touchdowns in such bunches that Ohio State immediately was dubbed The Scarlet Scourge, and Francis the First was known as "Close-the-Gates-of-Mercy" Schmidt. He was a bow-tied, tobacco-chewing, hawk-faced, white-haired, profane practitioner of the football arts--modern football's first roaring madman on the practice field and the sidelines, and so completely zonked out on football that legend ties him to the greatest football story of the twentieth Century. So caught up was he in his diagrams and charts that there was hardly a waking moment when he wasn't furiously scratching away at them. He took his car into a filling station for an oil change but stayed right in the car while the mechanics hoisted it high above the subterranean oil pit to do their work. Francis Schmidt, immersed in his X's and O's, simply forgot where he was. For some reason he decided to get out of the car, still concentrating on his diagram. He opened the door on the driver's side and stepped out into the void, which ended eight feet south of him in the pit. He refused to explain the limp which he carried with him to practice that day. It had really taken Schmidt only one year to enrapture Ohio State fans for what was predicted to be forever. At his first football banquet after a sensational first season capped by a glorious 34-0 shellacking of Michigan, Schmidt, in bayonet drill tones, bawled forth two classic and historic comments. "Let's not always be called Buckeyes," he brayed. "After all, that's just some kind of nut, and we ain't nuts here. [A debatable claim.] It would be nice if you guys in the press out there would call us "Bucks" once in a while. That's a helluva fine animal, you know." And then: "As for Michigan--Well, shucks, I guess you've all discovered they put their pants on one leg at a time just like everybody else." Bedlam. It was the apparently the first time the homely Texas line had ever been uttered in public and it swept the nation. 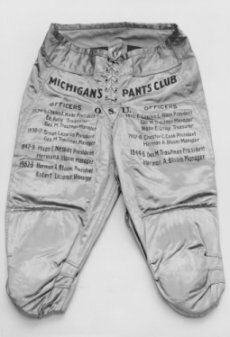 It also launched a "Pants Club" at Ohio State: thenceforward each player and a key booster who was part of a winning year over Michigan was awarded a tiny little golden replica of a pair of football pants. There were four straight, heady, lopsided victories over Michigan, 1934, 1935, 1936, and 1937. And in 1935, with one of the most talented teams of the decade, Ohio State played the epic game with Notre Dame, often called the greatest college game of all time. The Bucks succumbed to a fourth-quarter finish by the Irish, 18-13, but by then Francis Schmidt was the most talked about coach in the nation. But Francis Schmidt, despite his individual brilliance, coached football in a perpetual ambience of frenzied chaos. His staff was in a limbo of misdirection and uncertainty. Nobody knew from one day to another what the hell the mad genius was going to do. He heaped scorn and ridicule on his players and they hated him. There was open dissension. And after a couple of years the opposition began to catch on to his pyrotechnic style. Then, like other coaches before him, Francis Schmidt fell victim to the Michigan bugaboo. After four straight Buckeye victories, Michigan came up with a back named Tom Harmon, and in 1938, 1939 and 1940, Ohio State dropped three in a row. The 1940 game was particularly galling as Harmon ran for three touchdowns, raising his career total to 33 and breaking Red Grange's record. He also passed for two. The 40-0 pasting was the worst suffered by Ohio State since it had entered football's big-time. Francis Schmidt knew the Athletic Board was debating his future. He was the kind of man who'd rather die than be fired, so he quit before the board could act--as it certainly would have done. The board also accepted resignations of Schmidt's five assistants, two of who would later make names for themselves elsewhere: Sid Gillman at Cincinnati and later in the pros; and Gomer Jones, who would become the architect of Bud Wilkinson's great lines at Oklahoma and himself head coach there. When news photographers came around for a going-away photo, Schmidt, blatantly sarcastic to the end, told them, "You guys have dozens of my pictures in your files. Just dig out one of them and use it. And while you're at it, underneath it just say: 'Rest in peace'." Three years later, at Idaho, he died of a heart attack. Some say a broken heart. The point is, though, that Sid Gillman, who was a Buckeye end in the early 30's and an assistant under Schmidt is considered the father of the modern passing offense, and specifically the West Coast offense which he used as head coach of the Chargers in the AFL, where he won a title. He claimed that the principles of his offense were all based on what he was taught by Coach Schmidt. So Francis Schmidt is the inventor of the I-formation and the West Coast offense; few people have contributed so much to football and yet are so little known for it. Francis Aloysius Schmidt was born in Downs, Kansas on December 3, 1885 and died on September 19, 1944 in Spokane. After leaving OSU, he coached at Idaho from 1941-1942. Prior to becoming Buckeye coach, he graduated from Nebraska in 1914, coached at Tulsa from 1919-21, Arkansas from 1922-28, and Texas Christian from 1929-1933, where he also coached basketball. The Gold Pants club continues at Ohio State to this day.